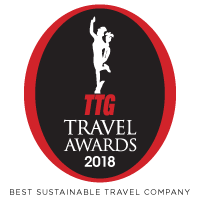 EXO Travel was recently awarded the ‘Most Sustainable Travel Company’ at the 2018 TTG Travel Awards held at Centara Grand, Central World, Bangkok Thailand on September 19th 2018. Represented by EXO’s Chief Operating Officer, George Ehrlich-Adam and Regional Sustainability Coordinator & EXO Foundation manager, Alexandra Michat and as well, supported by other EXO staff, they were proud recipients of this special recognition. Over the years, EXO Travel under the guidance of EXO Foundation, have strived to work towards sustainability and to mainstream responsible tourism. Aiming at maximizing their positive impacts on the people who surround their business, whether for agents, partners, friends, staff, suppliers, travellers or the communities they visit and work in and minimizing their environmental footprint. EXO’s latest efforts have been taking a stand together with 40 industry leaders against Illegal Wildlife Trade, our commitment to offset the carbon emissions of every passenger and employee in the region and ban on plastic wrapped wet towels. EXO is certainly not alone in this endeavor and we can achieve much more by working together across the industry to ensure that the world around us remains protected, cared for and preserved for future generations.